Another season, another mix pack by Beau's All Natural Brewing! This year's fall mix pack consists of Beau's Lug Treat Lagered Ale (Kölsch), Cranberry Derby - a pale ale with cranberries and oats, The Spice Principle - a heavily spiced German-style weissbier, and Sergeant Stripes - an export stout brewed with blackstrap molasses. I've reviewed Beau's Lug Tread lager before, so I've left it out of this review, you can take a look at my original review here. When I saw a beer bottle with a picture of a train on it, I knew I had to sample this one first (after Lug Tread, of course). I was a big fan of trains growing up and loved hearing the train horn in the distance next to the farm on hot summer days. I was once promised as a child that I'd get to go on a train ride right by the farm, it never happened - the very rail line that has been right next to my parents farm land since the beginning of the 20th century, was ripped up and salvaged a few days ago, never to be used ever again. I'll never hear the rare sound of the train going by the farm on a hot summer night at 3AM anymore, it saddens me. Sure, trains go by my place here in Brandon all the time, but it's not the same. 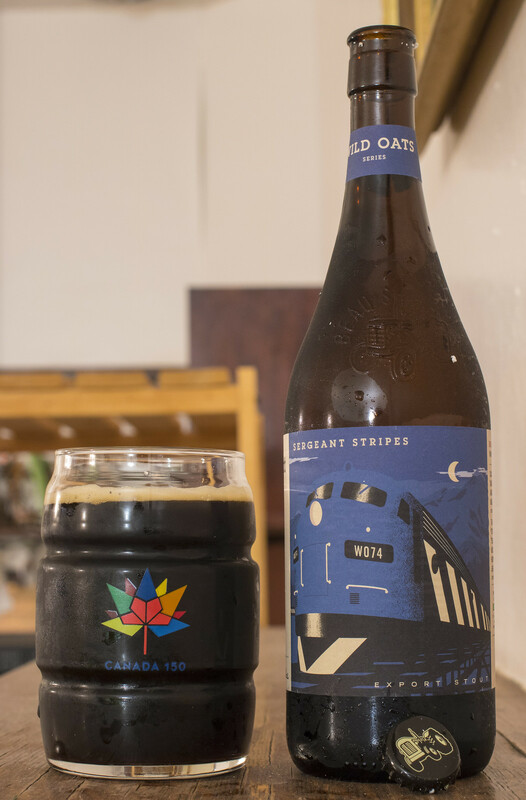 Sargeant Stripes is an Export Stout brewed with blackstrap molasses and organic hops/barley and other ingredients. This recipe dates back to when UK brewed large amounts of stout destined to places like Jamaica, with high gravity so that it would survive the travel. 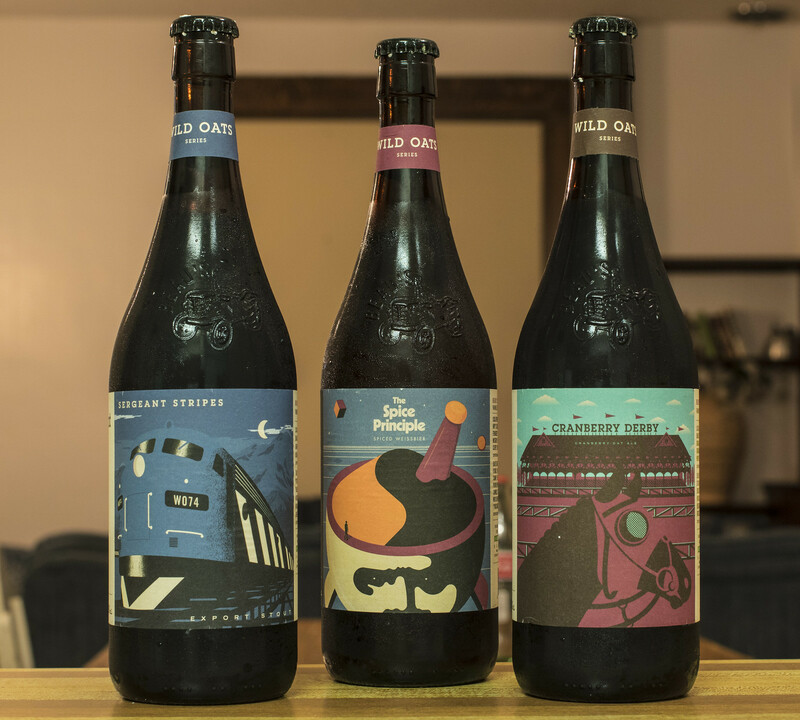 Nowadays, some of Jamaica's best beers are Export-style stouts. Appearance: Black, heavy, with a brown cola-like hue to it. There's a fairly moderate amount of rich dark yellow head on top at first, gradually diminishes to being mostly around the side of the glassware. Aroma: It's hot outside and the aroma is reminding me of being on the beaches of Negril. This is a sweet yet bitter stout that is well received both in the summer but also in the winter. Rich notes of molasses that give it that overly sweet yet strange bitterness to it. Notes of caramel, a hint of coffee, and a light pear fruitiness at the end. Taste: Not quite as strong as Guinness Extra Foreign Stout or Dragon Spitfire but this is pretty solid - it has notes of - again - molasses, caramel, an earthy hop presence, a bit of dark chocolate, pears - again, and a light burnt grain taste at the end for the aftertaste. Overall Thoughts: Rich, sweet, 7.9% and has a train on it! This is absolutely solid and makes me kind of miss Jamaica right now, especially for the stout with jerk chicken.. yum! There's an abandoned railroad right outside the Appleton Estates distillery, there was a time when trains would collect the sugar cane and bring it directly to the distillery, rather than using the overused road system. 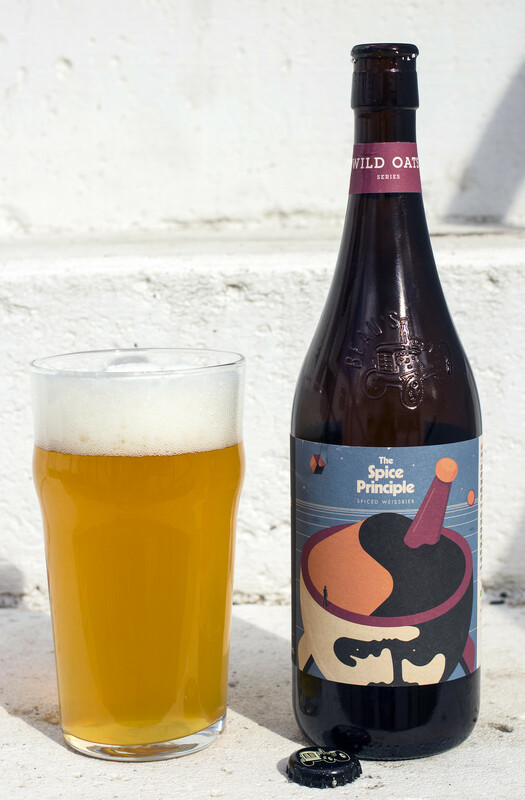 The Spiced Principle is a German-style Weissbier brewed with twelve organic spices to give it a unique, interesting profile to it. The spices include: coriander, tumeric, cumin, fenugreek, cayenne, black pepper, yellow mustard, ginger, cinnamon, cardamom, cloves and nutmeg. That's a wide range of spices! It's almost as if they were creating a dinner and it was too overcooked so they threw in a bunch of spices to mask the flavour.. but thankfully with knowing Beau's, it's not! Appearance: Pours a cloudy, golden straw body with a liberal amount of head to start off that gradually diminishes to .5 finger's worth of head. Light amount of carbonation. Aroma: This is incredibly interesting and complex.. but it's not a surprise as there's twelve different spices that go all over the place in this beer. The first thing I got was a hint of black pepper followed by a classic German weisse with a hint of banana to it. Aside from the black pepper, there's a good amount of spiciness from cayenne pepper. There's a bit of a curry spiciness from the cumin, notes of cinnamon and nutmeg that is completely autumn forward. I was expecting more coriander - it's there, but it's incredibly minimal. Every single one of those spices pops up here and there, and with each of these spices pushing for more savoury than sweet, I'm surprised that the combination actually seems to work in this beer so far. Taste: The beer starts off with a sweet banana & clove beer, followed by notes of black pepper, cayenne (which gives off a bit of heat in the mouthfeel), a hint of coriander, cumin and gradually some cinnamon and nutmeg popping out the more I drink this. The thing that surprises me most about this beer is with all these savoury and spicy seasonings in this beer, the beer still has a great sweetness to it that makes it easy to drink.. though I'm finding that I'm starting to get a bit of heart burn from the spices. 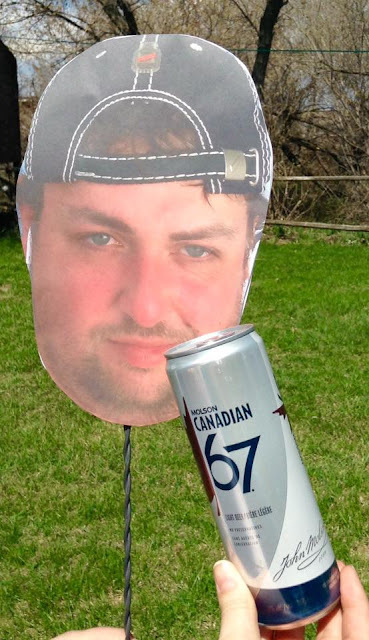 Is this beer spicy? A bit, yeah, but still not as hot as Dieu du Ciel's Route des Épices or Rogue's Chipotle Ale (which wasn't that hot either). Lastly, we have Cranberry Derby Cranberry Oat Ale! 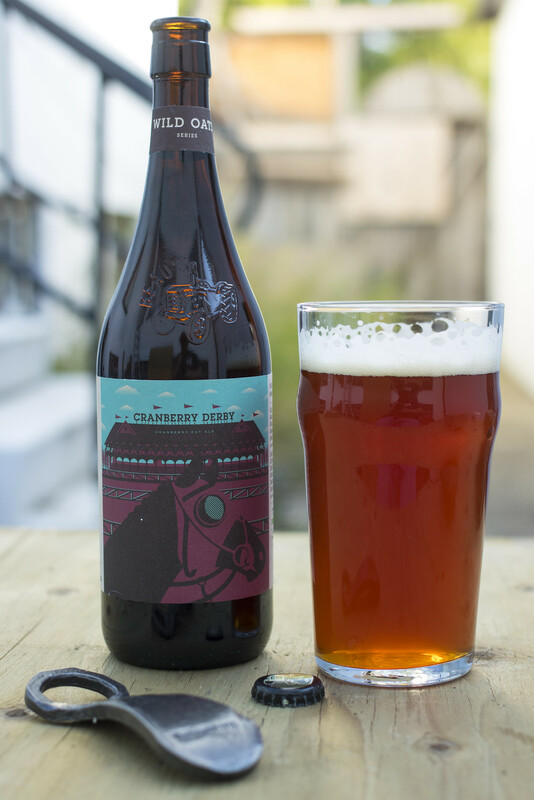 Cranberry Derby is a berry-infused pale ale brewed with a combination of organic cranberry juice, organic cranberries, oats and all the usual suspects! Appearance: Cranberry Derby pours a bright caramel-reddish body with a good amount of beige head on top which gradually diminishes into just a bit of film on the top of the beer. Minimal carbonation, has an appearance that reminds me of the Ocean Spray juices I used to buy a few years ago that turned out to be mostly sugar. Aroma: The second I capped off the beer, the smell of cranberries poured out everywhere! This is reminiscent to a few of the cranberry ales I've had over the years, including Unibroue's Éphémère Canneberge. It's a sweet yet tart aroma with a good amount of yeastiness to it. There's a malt profile that I can simply describes as Lug Tread - a sweet, grainy malt aroma that seriously gives off Lug Tread vibes. Other notes include bubble gum, a hint of pear, and a bit of oatiness. Taste: The first thing that comes to mind is Lug Tread! 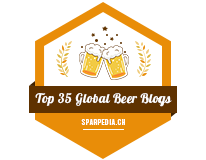 It has that classic grainy and sweet malt-forward Kölsch that everyone knows and loves (unless if you dislike Kölsches). The flavour of cranberries immediately grabs my attention immediately after being reminded of Lug Tread. This is a mildly tarty cranberry ale with a bit of sweetness to it, but not much. The dominating flavour isn't the cranberries themselves.. rather it's the malt and oat cereal profiles that pop up the most. I was expecting overly sweet and tart, instead it's fairly light and balanced - Yes, it is still tart and a bit sweet, but definitely lighter in flavour than the two other beers I reviewed.